London Mayor Boris Johnson is alleged to have launched a tirade of swear words at Keith Vaz, the Labour chairman of the Commons home affairs committee. 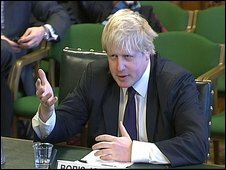 The two clashed in a phone conversation after Mr Johnson gave evidence to the committee about a Tory MP's arrest. Committee members say they were shown a transcript by Mr Vaz suggesting "the mayor used the F-word 10 times". Mr Johnson's aides deny that he swore so many times, instead saying that he "once or twice used strong language". The conversation's alleged details emerged in London's Evening Standard newspaper. In a statement in response, a spokeswoman for the London mayor said the two politicians had held a private conversation after "Mr Vaz and a committee colleague appeared on BBC television accusing the mayor of being uncooperative and confused". "The mayor made his points forcefully and once or twice used strong language, because he believes he has been cooperative and courteous on all the issues of concern to the committee and sought to answer every further question that has been put to him," she added. "Despite this, Mr Vaz has repeatedly suggested otherwise." The conversation took place last week after Mr Johnson gave evidence to the committee about his conversations with Conservative leader David Cameron about the arrest of Tory MP Damian Green. According to the alleged transcript the mayor repeatedly used the F-word and accused Mr Vaz of "bulls***". Minutes of the conversation were produced and circulated to members of the committee. One said there was "shock" at the vehemence of Mr Johnson's barrage. Mr Vaz told the BBC on Thursday he was "very disappointed" that the transcript was in the public domain. Asked if he had recorded the conversation and whether he stood by the transcript, Mr Vaz said: "I have nothing to say about the conversation. The mayor is a witness in an inquiry. The information was passed to the committee. "I'm very disappointed that it has been released but we need to move on from this. This happened a week ago. As far as I am concerned the matter is closed." Details of the conversation have been revealed the day after Mr Vaz wrote to the Conservative mayor saying his committee had "deep concerns" about the evidence it had been given. Mr Vaz said in his letter that his committee was also concerned about the "level of respect and courtesy shown". He accused Mr Johnson of giving four different accounts of events ahead of Tory MP Damian Green's arrest. Mr Johnson wrote back to Mr Vaz later on Tuesday to provide more details and said he had fully cooperated with the committee and regretted suggestions to the contrary.